Last week I shared with you how to grow a better lawn based on what I learned from my education at Pennington Seed. Part of growing a more beautiful lawn is learning how to water it properly. Did you know that the majority of homeowners overwater their lawn and plants? Typically your yard only needs 1 inch of water per week (1/2 inch waterings two times a week) If you install your own sprinkler system with a timer and a rain gauge, you can insure that your lawn and/or landscaping gets just the right amount of water. When we lived in our old house, Pretty Handsome Guy and I received a quick tutorial on installing a sprinkler system in our yard. Our neighbor — the previous owner of our current home (Yes, it’s complicated like that.) — showed us how to piece together pvc pipes, add spray heads and set up a timer to water our lawn. Now I’m passing this information on to you. Here is the Pretty Frugal Girl’s method for installing your own sprinkler system! Disclaimer: This is my frugal budget sprinkler system installation. Before you take on this project, you will need to check with your local ordinance and any laws that may pertain to residential sprinklers and water usage. I am not responsible for any omissions that might be included in a “professional” irrigation installation. In fact, I’m prepared to be slammed by some irrigation companies for “doing it wrong”, but this is the system that worked for us. Safety: It is very important to call your local utility companies and have them mark the location of your power, water, gas and other utility lines so you won’t accidentally dig into them. Normally this takes a week to 10 days. To be safe, allow up to two weeks. In most areas you dial 8-1-1 to notify all the utility companies at once. Or look up Ms.Utility in your area. 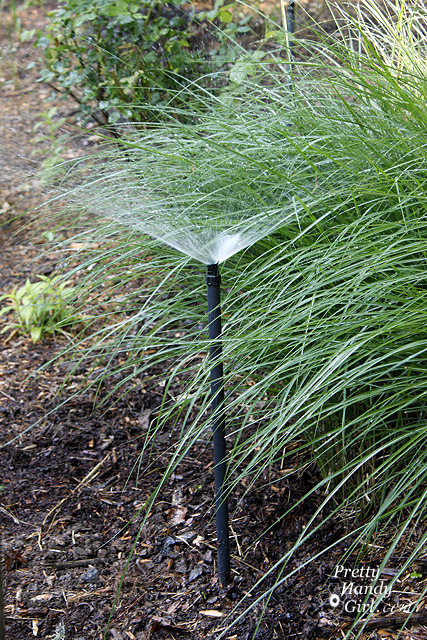 Drawing Up a Plan: Before you begin you will need to draw up a plan for your sprinkler system. You can try to do it yourself. OmniNerd has some ideas for drawing up your sketch. Or you can send your yard and water information to RainBird and have them design a plan for you. In order to create your plan you will need to calculate your gallons per minute (GPM). Choose a 2-5 gallon bucket and set it under your spigot. Turn the water on full blast and record how many seconds it takes to fill the bucket. And you will need to know your water pressure. Purchase a water pressure gauge to determine your home’s water pressure and how many heads you can add to the sprinkler system. The gauge shown above can be purchased from Home Depot for only $11. Locate your home’s outside faucet. If there are more than one, choose a spigot close to the location you want to start your sprinkler run. The further away from the water source you get, the lower your pressure is and the less effective your sprinklers will be. Also be aware that if your pvc pipe has to run uphill (against gravity) you will lose pressure as well. Make a list of all the parts you will need based on the size and location of your sprinkler heads. Be sure to buy extra parts. (You never know when you will need to make a design change or have a faulty part.) You can always return the extras later. You may want to keep some extra parts on hand for future repairs. Start by adding a backflow preventer onto the faucet. Attach a two head hose connect (diverter) if you wish to continue to use this spigot in addition to the sprinker system. From the hose connect, attach a piece of flexible garden hose. Clamp the other end of the hose to a threaded connector. This connector gets attached to the PVC pipes. When using flexible pipe that is exposed (as shown below) it is a good idea to add foam pipe insulation over the hose to protect it from freezing if there is a sudden dip in temperatures. Walk out from the faucet along the path your water pipes will take. It is very likely that you will need to dig under or through obstacles. I had to chip away at the mortar on a retaining wall to run the pvc pipe through the wall. At our previous home, we had to run a pipe under the sidewalk. This can be done by putting a cone shaped head on the end of the pvc pipe and let the force of the water dig through the dirt (and mud) for you. In the end, you should have a nice little tunnel under the sidewalk. Lay out your pipe on the ground. Choose 90 degree or 45 degree angle connectors depending on the shape of your sprinkler run. After you have laid out the configuration of your sprinkler system. Start cutting your pipes and select the connectors you will be using. Or a pipe cutter. Either will work, just use what you have. Use a piece of sandpaper to smooth off any rough edges at the cut. Dry fit all the connectors and pipes together. When the layout is perfect, dig a trench 6-12″ deep below the pipes. This depth helps to protect your pipes from accidentally being damaged during any planting or other landscape work. In a colder climate region this depth will be necessary to prevent your pipes from freezing should the temperatures drop before you have time to blow out your sprinkler system. After your trenches have been completed. Lay your pvc pipes into the trenches. Make any adjustments as needed. If everything fits you can begin to glue your pieces together. Wipe off any dirt or debris around the connection areas. Before you can glue your pipe and the connector, you will need to use a PVC primer. The primer softens the plastic and allows the glue to create a permanent bond. Coat the inside of the connector and the exterior of the pipe with primer. Open the glue (PVC cement) and coat the inside of the connector and the outside of the pipe. Work quickly because the glue will harden fast. Twist the connector back and forth until it is fully seated onto the pipe. Make sure that your connector is pointed the appropriate direction before you release your grip. After all the connections have been made, screw in any risers to the T-connectors that are threaded. Wrap plumber’s tape around the threaded pipe ends to get a more water tight seal. At the other end of your system, install a screw off end cap to allow for clean out before winter. If you don’t blow out any excess water before the temperatures dip, you run the risk of the water freezing and cracking your pipe. Turn on the water to flush out the system. Any dirt or debris left in the piping can cause a blockage to occur. Once the system has been flushed, go ahead and attach your sprinklers, misters and spray heads. RainBird offers a wide variety of pop-up heads that spray in arc and round spray patterns. Different heads determine the distance they can spray from the head. After all the sprinkler heads have been attached, it is time to test your system. Turn on the water at the spigot. While the water is running, adjust the spray patterns of the heads to the desired arc pattern and diameter from the sprinkler head. After the sprinklers are working properly and you have inspected all the pipes and connections for signs of leaking, begin to bury the piping. Cover all the exposed pipe under 6-12″ of soil. I highly recommend installing a timer on your sprinkler system. The timer simply screws onto your faucet between the faucet and the sprinkler system hose. The timer has an internal valve that opens at the pre-determined time of day and for the length of time and day you select. Set the timer to run 2-3 times a week. A rain sensor can also be added to the system, it will detect any rainfall and automatically shut off your system to conserve water and protect your landscaping from being overwatered. The best time to water your landscaping and lawn is early in the morning. Watering overnight can lead to disease and fungal growth. You will need to test how much water your system puts out and tweak how many minutes your system should run. Overwatering can stress plants just as much as under watering. Have fun and enjoy those spring flowers! If you want to amp up your landscaping, learn how to install low voltage landscape lights. How much water pressure and gpm do i need from my faucet to run how many spray heads for an efficient irrigation system? Thanks, Great Tutorial! George, I’m sorry I don’t know the answer. I think you can get the answer from Rainbird or another sprinkler brand. Great write-up for a simple system! Of course the backflow prevention is needed, and is probably the most important piece of the system. No one wants any of the animal/insect waste, fertilizers, etc out there getting into the home water supply after the sprinklers shut off. Otherwise, it’s not the greatest or most efficient way to water, but we all know that not everyone can afford to have a fully automated system professionally installed. If this diy system fits the budget and does the job, its well worth it! And this is coming from one of those irrigation companies that were supposed to slam you for “doing it wrong”! Loved your tutorial! Thank you for explaining it so well. We referenced your article on our blog and obviously gave you the credit! Great stuff and thanks again, will be coming back for more! The way to tunnel under the sidewalk! BRILLIANT!!!! I’m not kidding, that’s BRILLIANT!! Thanks for the great tutorial! Your system is exactly how I was planning on doing mine. I just have a question. Can you clarify? The ones in the picture are exactly what I was planning on using.